It wasnt that long ago that First saw Western National as a bit of a dumping ground and almost any old rubbish seemed to turn up. In fact this bit of old rubbish was actually a very comfortable and civilised bus - as long as you could manage the climb up the steps. 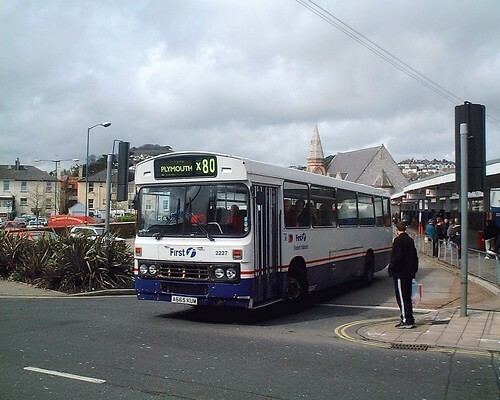 Not too bad on a long distance service like the X80 - but it also occasionally turned up on Plymouth City low floor services! For an oddity in the fleet it did actually last for quite a long time so i guess the drivers must have liked it. It certainly always seemed to have a good turn of speed! I should mention that blog posting may get interrupted over the next week or so as my Dad is back in hospital again and is very poorly - and the outlook is grim to say the least. Sorry to hear about your Dad - you are in my thoughts and prayers. Same here, I'm sorry to hear about your Dad. I wish him and yourself all the best and hope he pulls through.